Crystalline materials can be characterized and distinguished according to the structure of their unit cell. The phenomenon of one chemical species showing more than one possible unit cell configuration is known as polymorphism. Many crystalline materials can form different polymorphs in order to minimize their crystal lattice energy under specific thermodynamic conditions. While the chemical nature remains same, the physical properties (solubility, dissolution, nucleation & growth kinetics, bioavailability, morphology and isolation properties) can vary between polymorphs. What Process Challenges Does Polymorphism Cause? Knowledge about the stability of crystal forms and tightly controlled processing conditions are critical to obtain a desired polymorph. Often a simple change in temperature, agitation or solvent composition can cause the material to change from a metastable form (local energy minimum) to the stable form (global energy minimum). The solubility curves of enantiotropic polymorphs cross at a specific point in the phase diagram, for example, a certain temperature. The graph on the right shows that at higher temperatures Polymorph 1 is stable (lower solubility), whereas at lower temperatures Polymorph 2 is stable (lower solubility). Crystals of Polymorph 1, nucleated and grown at higher temperatures, often transform to crystals of Polymorph 2 when the temperature falls below the transition temperature. The change in crystal structure often means a change in the external shape, which can have a significant impact on isolation and downstream properties. If cube-like crystals change to thin platelets filtration time can significantly be increased due to caking of the material on the filter. If the transformation forms a solvate, it often increases drying times until the additional solvent is evaporated. 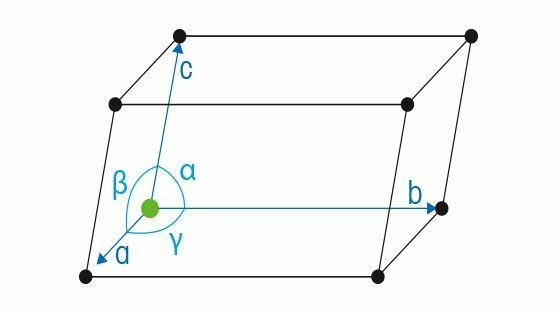 If formulators are used to a prismatic crystals and suddenly have to work with needles, formulation of the final product might not be possible. A more stable polymorphic form usually shows lower solubility, which will reduce bioavailability and in vivo performance making a drug less effective. Late discovery of a more stable polymorph can hence have disastrous effects on the supply of a drug product and can even cause patent conflicts, if the more stable form is already patented. How Is Morphological Transformation Identified? In most crystallizations, it is necessary to obtain the same polymorph and morphology for every batch because the wrong polymorph would make the product unacceptable. However, in crystallization it is common for an unstable form and morph to appear first and later transform to a stable form. Offline endpoint analysis will document the final form but will miss the information whether polymorphism transformation occurred earlier in the process. The use of in situ analytical tools is critical for developing knowledge of the crystallization behavior throughout the entire process. In situ particle size and count trends as well as in situ process images record the change of morphology with elapsed time. This allows critical investigation of the impact of processing parameters like temperature, agitation, and solvent composition on morphology and transformation kinetics at any time along the process. In some cases, new polymorphic forms can appear during development and fast identification is critical. In other cases, the presence of more than one polymorph is known, and an in-process transition is required to produce the desired polymorph. 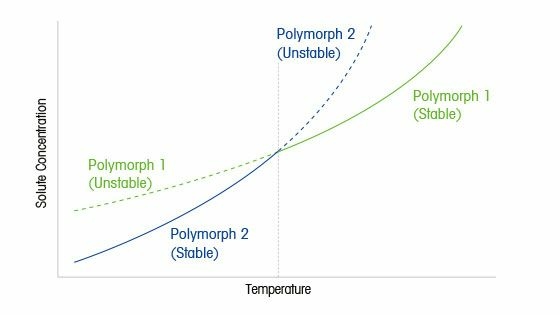 For both cases, it is useful to apply PAT methodology to ensure that the transition from the less stable to more stable polymorph occurs consistently across all scales and operating conditions. In this example, a polymorphic transformation is studied. 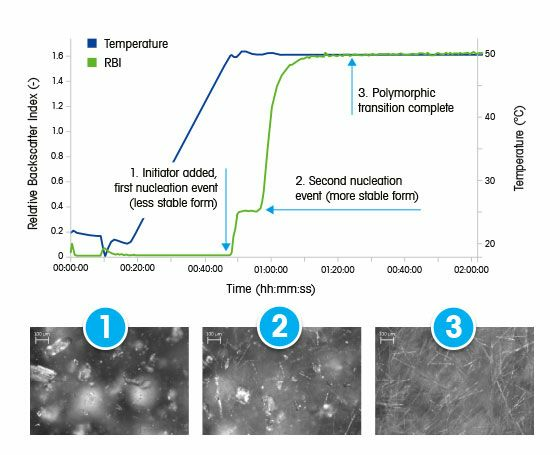 Both the RBI and real-time microscopy images provide detailed and unambiguous process understanding. When the initiator is added, nucleation occurs immediately, as indicated by the rapid increase in the RBI signal, corresponding to the formation of crystals. While the temperature remains constant at 50 °C, the RBI reaches a steady state, but soon increases again rapidly – indicating a second nucleation event has occurred. Checking the real-time microscopy images confirms the presence of a second crystal morphology has nucleated, which can be verified as a different polymorphic form using offline XRD analysis. Over time, the transition from the less stable for the more stable form occurs, until the RBI trend again reaches a steady state, and the real-time microscopy images show that only needle shape crystals persist. This case study demonstrates the ease with which scientists can obtained extremely useful process understanding using a PAT, which is simple to implement and requires very limited data analysis expertise. ParticleView Real Time Microscopy is an easy-to-use PAT tool that records high resolution images of particles and particle structures as they naturally exist in process. Each image is analyzed in real time providing a simple trend that follows particle size, count and shape under real process conditions. Image processing although extremely powerful in the identification of various polymorphs often requires a secondary technique to distinguish between polymorphs. Raman spectroscopy offers a powerful technique that allows for differentiation of desired polymorphs by looking at the differences at a molecular level. Raman utilizes the change in polarizability or electron cloud deformation of a molecular bond. Molecules exhibit "fingerprint" vibrational patterns and a Raman Spectrometer is able to identify different polymorphs by their characteristic fingerprints. Polymorphs are chemical compounds that although have the same chemical formula, exhibit different lattice structure. Differences in the length and angle of the bonds will produce a different fingerprint allowing the Raman user to monitor polymorphism over time. In situ Raman spectroscopy allows the user to directly track reactants, reagents, intermediates, products and by-products as they change during the course of the reaction. Raman provides critical information to scientists as they research, develop, and optimize chemical compounds and crystallization processes. Kinetic trends (right) for the conversion of Form 1 to Form 2 are easily generated in iC Raman 7. How Do You Analyze Polymorphism? Compact Performance. ReactRaman combines best in class performance with a flexible design. The spectrometer is small, light, and thermally stable, delivering outstanding results wherever it's needed. Fast, Accurate Results. 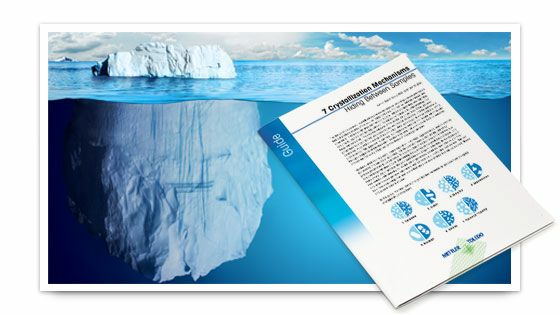 Optimized for in situ monitoring, ReactRaman delivers precise, sensitive spectra that can easily be converted to results with One Click Analytics­™ in iC Raman 7. Integrated Platform. 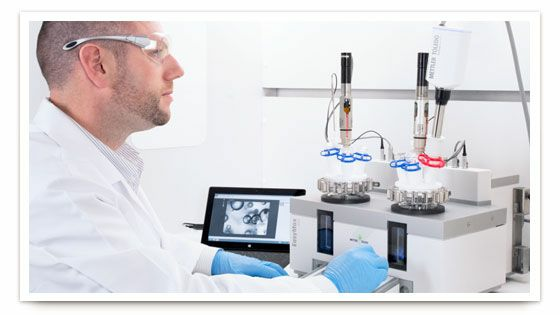 Combine with Mid-IR, Particle Characterization, and Automated Chemistry Reactors for comprehensive understanding and control. Shared Expertise. 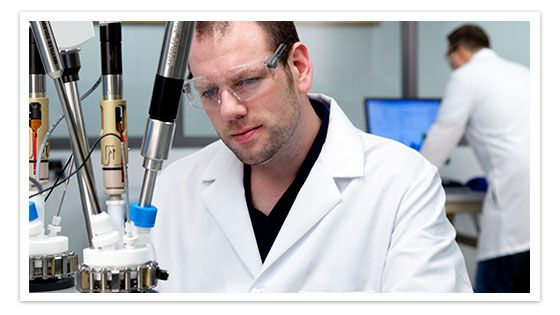 With over 30 years of reaction analysis expertise, we are committed to developing high-performance solutions so that scientists can solve challenging chemistry problems. A Polymorphism Workstation with in situ PAT provides real time process data for immediate interpretation, substantially reducing development time and cost for offline analytical work. Do Hidden Polymorphs Put Your Process at Risk? Below is a selection of polymorphism articles in publications. Zhao et al. "Combined Application of in-situ FBRM, ATR-FTIR and Raman on Polymorphism Transformation Monitoring During the Cooling Crystallization" Industrial & Engineering Chemistry Research (2012), 51, 12530-12536. Hao et al. "A Calibration-Free Application of Raman Spectroscopy to the Monitoring of Mannitol Crystallization and its Polymorphic Transformation" Organic Process Research & Development (2010). Lai et al. "Control of Polymorphism in Continuous Crystallization via Mixed Suspension Mixed Product Removal Systems Cascade Design" Crystal Growth & Design (2015), 15, 7, 3374-3382. Takeguchi et al. "Effect of temperature and solvent of solvent-mediated polymorph transformation on ASP3026 polymorphs and scale-up" Organic Process Research and Development (2016), 20, 5, 970-976. Liu et al. "Investigation into the Cooling Crystallization and Transformations of Carbamazepine Using in Situ FBRM and PVM" Org. Process Res. Dev. (2013), 17, 11, 1406-1412. Hao et al. "The use of in-situ tools to monitor the enantiotropic transformation of P-aminobenzoic acid polymorphs" Organic Process Research & Development (2012), 16, 1, 35-41.